Today we are going to share one more amazing product that is an earbud under 50 dollars. 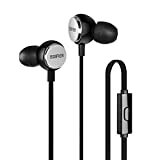 Even it is one of the Best Earbuds Under 30 dollars. So, my dear readers let’s get ready to check out this complete review. True to its reputation, Edifier has launched another quality Earbud called P293 in the market and as expected it has captured the attention of the people. In spite of equipped with top of the line capabilities, the product displays streamlined appearance. Users can select from three colors including the dark green version, however, all of them are attached to a silver plate for contrast. As far as the ear pieces are concerned, they seemed to be a little bigger than the normal ones however the cable attached to them can easily withstand strains of varying degrees. It is sufficiently long to be connected to the player and doesn’t cause any discomfort to the individuals. The addition of adapter prevents the breaking of cables while you are moving around with the portable device. EDIFIER P293 also comes with a driver nozzle that is inclined at an angle but provides seamless performance when compared with the direct nozzle system. Unlike its predecessors, the product is devoid of MEGABASS tag; therefore the voice coming out of the ear bud is extremely clear without any noise. In addition, the performance of EDIFIER P293 doesn’t dip with the change in current intensity. It displays an impedance of 106DB per MW and 32 OHM impedance to deliver sterling performance to the users. One of the most important attributes of the ear bud is that the bass is well defined and the sound doesn’t break at any point of time. Other products in similar category try to eliminate the treble, however, P293 is a different kettle of fish. It doesn’t let the bass go south but delivers clear sound in an impeccable manner. Ear buds comes with a button on the MIC that allows users to switch between music and calls. Users do not have to look at the phone to accomplish the task. A simple click is all that is required and you can directly chat with your friends while listening to the latest song. In fact, people can skip the undesirable track by pressing the button twice. Placement of the microphone is right to capture the sound signals while voice call quality is second to none. P293 scores over its peers in term of extra MIC, however, it is hampered by narrower frequency response to the sound signals. In addition, 4 color options are available to the users while the established players are selling their ear buds in 8 categories. P293 is also way ahead of playing high fidelity sound compared to other ear buds available in the market. The product from Edifier is probably the best value for money buy as it sports an ergonomic design with high performance. The item arrives with 3 types of ear buds catering to all sizes and one year warranty, so you do not need to panic of something goes wrong. Light weight and portability are the other pluses that make P293 a must have product for the users. With a price below 30 dollars, you get pocket dynamite in your hands. Plug it right away into the phone or any multimedia device and enjoy wonderful tracks while driving the vehicle on the cruise highway. Users would not feel comfortable even for a single second as the ear buds are gentle to the ears. In short, if you are still apprehensive about the capabilities of the device, rest assured it can keep on delivering wonderful sound day in and day out for a very long time.